one of my favorite things about spring in new york is how it reinvigorates the farmer’s market in union square. the market never quite disappears in the winter, braving those chilling days when it feels like the wind could cut straight through your cheeks and leave you wounded – but in the spring, it truly comes alive again. the square bustles with people: moms pushing double strollers and dads carrying babies and baggus. teenagers skateboarding past the strawberries and young couples picking out fresh flowers one by one. this past weekend was the first one in the city that truly felt like spring. i went to sleep on friday night, and when i woke up saturday morning, the sun was shining bright. the clouds were so fluffy it looked like if you jumped high enough you could land in them, sinking into their softness and squeezing in a 20 minute power nap. it was the perfect spring day: crisp air, highs in the upper fifties, the promise of something new and beautiful to come. weather like that, it makes you forget that someone puked on the subway before. it’s like someone colors the city with a hazy, rose tint, and all of a sudden, everything is wonderful and nothing bad exists. it is, in other words, the perfect time to go shopping. and so shop i did. i came home from the farmer’s market with a slew of fresh fruit and veggies and on sunday afternoon, i took to my kitchen and went nuts. i made homemade chocolate chip cookie ice cream (recipe to come later this week), and then decided to meld all my fresh spring veggies into one delicious spring pasta. it was so delicious that i thought you might want to make it for yourself. what’s that? you do want to? great. the how-to is below. this recipe is insanely easy to make. it’s so simple, in fact, that i’m not even really sure it counts as a recipe. but whatever. it’s my blog and i can lie about recipes if i want to. so, let’s do this thing. to start, slice all your veggies. you can use whatever spring veggies you’ve got around. i threw some frozen peas in at the last minute, and damn, were they good. your veggies should be cut into approximately 1″ pieces. they don’t have to be baby bite size, but you also don’t to be shoving an entire asparagus stalk in your mouth at one time. and if you do, well, you’re not allowed to eat at my house. put a pot of cold water on the stove and bring to a rolling boil. when it gets there, dump in your pasta and add a pinch of salt. while your pasta is cooking, saute your veggies. put your olive oil into a pan and give it about a minute to heat up. add your diced garlic and give that a minute to get all fragrant and wonderful and garlicky. now, dump in your veggies. if your pan is too dry, feel free to add a bit more olive oil. a little more EVOO never hurt no one. while your veggies cook, zest your lemon into the pan. mmm, smell that lemony deliciousness. SO GOOD. don’t juice it just yet. that will come later. when your pasta is done, drain it and reserve a tiny bit of the pasta water. pour it into a pretty bowl. now, add the sautéed veggies on top of it. take a fork and mix it all together for good measure. now, juice your lemon over the pasta and mix again. smells good, doesn’t it? season with salt and pepper to taste, and grate some fresh parm on top. et voila! 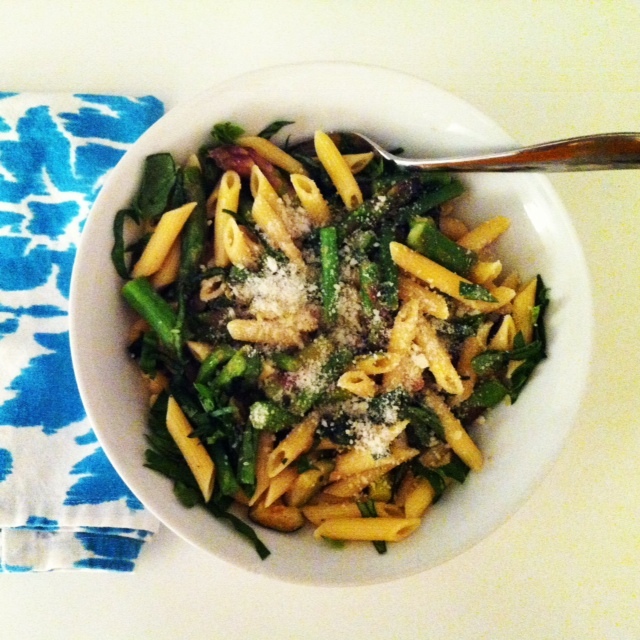 a delicious spring dinner. note: if you’re looking to even this dish out, i’d recommend sautéing some shrimp with a bit of lemon juice, or grilling up some chicken to slice on top of it. protein’s great and all, but man, sometimes a girl just wants CARBS. now, go forth and make something springy!